Let’s keep the bourbon cask train parked in the eastern Highlands. I’ve said rude things about distilleries such as Deanston before; but where Deanston is merely held to be inoffensive, Fettercairn is openly scorned by many whisky geeks. The only other malt I’ve had from them was in fact quite well received but I thought it was just a bit above average: the Fior from a couple of years ago. Of course, reputations are unreliable; sometimes they rest on past sins/laurels, and even where justified on the whole are never descriptive of every cask of whisky that’s come out of a distillery. 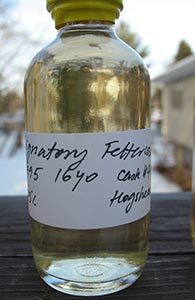 On this blog I’ve previously noted very positive experiences with malts from Loch Lomond and Miltonduff, both of which have poor reputations on the whole as well; will this Fettercairn be an outlier like those may have been?